There's one flaw with Destroy All Monsters that almost kept it off of this list: it's unbelievably boring. 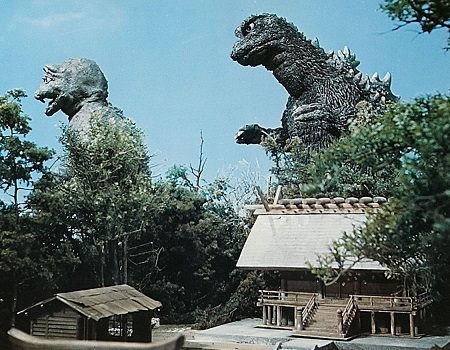 Who knew that a film with a climax that features pretty much every major kaiju in monster iconography - including but not limited to Rodan, Mothra, Manda, Baragon, Varan, King Ghidorah, and the big man himself, Godzilla - could be so unrelentingly dull? But that's what happens when you ship all of these characters off to Monsterland and focus most of the plot on flat human characters. So why does Destroy All Monsters rank so high on this list? As yawn-inducing as the human stuff is, the monster stuff drills right down to the core of why we love kaiju in the first place. Watching Ghidorah take on Toho's whole stable of beloved behemoths is a reminder of how much fun it is to see these towering creatures go at it and incur astronomical collateral damage at the same time.